A child’s birthday is a very special event, not only for the child but also for the parents. On that special day, however many years ago, you were blessed with the birth of your child and he or she is now another year older. Maybe it seems like just last week your child was learning to sit up or crawl or walk; now, you can’t get her to sit still! Now, she has her own personality and interests and she’s her own independent mini-adult. It is truly amazing to watch your child grow through the years. My 4-year-old daughter, even at just 4, seems much older than she really is. She is a pro at playing computer games, she wants to do everything herself, she’s bossy, and it’s hilarious to hear her say grown-up words and phrases, such as “That’s not dignified!”. Not long ago, she was crawling through the living room babbling out baby words, “dum dum diggum” was one of her baby word phrases. At that point in time, I could not picture her as she is now – walking, talking, having conversations with her. My 2-year-old son isn’t talking yet, although he’s excellent at saying “dada” and “mama”. I couldn’t believe it when he turned 2 in July. He is such a trouble-maker. He is into everything, constantly. He’s just figured out how to open the refrigerator and yesterday morning he grabbed a piece of leftover pizza for breakfast! I didn’t have any ideas on how to keep the refrigerator door locked, so we’ve taped the refrigerator shut! It’s impossible to know how your kids will change as the years roll by, but you can always be certain of at least one thing – they love birthdays! Everything about a child’s birthday is a dream come true for them. There’s cake, ice cream, presents, fancy decorations, friends and family. What’s not to love about that? I was honored to have been asked to bake cupcakes for a friend’s son’s birthday earlier this month. It was his 4th birthday, and as my little girl is 4, I know how special it must have been for him and his family, and I was so happy to have been asked to provide the cupcakes for his special day. My friend didn’t have a solid idea as to what kind of cupcakes she wanted for her son except that the cupcakes had to be filled; she basically left the design up to me. After a bit of a think, I asked her how they would like ice cream sundae cupcakes, to which she replied that that would be great! These couldn’t really have been more perfect for a child’s birthday – ice cream in cupcake form! And they really look like sundaes! These chocolate cupcakes are filled with chocolate ganache, frosted with vanilla buttercream, swirled with more chocolate ganache and decorated with sprinkles and maraschino cherries. They tasted fantastic! I have to be honest. I baked extras of these cupcakes so that we could have some too! Well, I had to taste them to make sure they were good enough for my friend’s son’s birthday! And they were good enough, of course; everyone loved them. Chocolate cupcakes with ganache filling and vanilla buttercream frosting, drizzled with ganache glaze. Topped with sprinkles and a cherry. For the cupcakes: Heat oven to 350°F. Line muffin cups (2-1/2 inches in diameter) with paper baking cups. Fill cups ⅔ full with batter. Bake 22 to 25 minutes or until wooden pick inserted in center comes out clean. Cool 10 minutes; remove from pans to wire racks. Cool completely. Using the cone method, fill cupcakes with chocolate ganache (recipe follows). Frost with buttercream (recipe follows) using a round piping tip, then spoon chocolate ganache glaze (recipe follows) on top of buttercream. Put sprinkles on as soon as you finish putting the ganache on each cupcake, just in case the ganache hardens too much for the sprinkles to stick. Push a maraschino cherry into the top of each mound of frosting (the ones with stems make a better presentation!). For the ganache filling: Chop the chocolate and transfer it to a heatproof bowl. Heat the cream until simmering and pour it over the chocolate. Let it sit for one minute and then stir until smooth. (If this has not sufficiently melted the chocolate, you can return it to a double-boiler to gently melt what remains. 20 seconds in the microwave, watching carefully, will also work.) Add the butter and stir until combined. I put the ganache in the refrigerator to firm it up just a little teeny bit, about 15-20 minutes I think it was. It was still pourable, but it wasn’t dripping everywhere, either. For the vanilla buttercream: Beat butter with a mixer on medium-high speed until pale and creamy, about 2 minutes. Reduce speed to medium. Add sugar, ½ cup at a time, beating after each addition, about 5 minutes. (After every 2 additions, increase speed to high, and beat for 10 seconds, then reduce speed to medium-high). Add vanilla, and beat until buttercream is smooth. For the ganache glaze: Place chocolate in a medium-size heatproof bowl. Bring cream and corn syrup just to a simmer in a small saucepan over medium-high heat; pour mixture over chocolate. Let stand, without stirring, until chocolate begins to melt. Gently stir chocolate and cream until totally combined; begin near the center of the bowl and gradually work your way toward the edge, pulling in as much chocolate as possible, until the mixture is smooth and glossy. These are sooooo cute and they look delicious! I am new to your blog, and lovin’ it! Great photos!! My God these look like the best cupcakes I have ever seen. I have always wanted to play around with the Ice Cream Sundae flavors but no need now, you have perfected this! oh my gosh these are the cutest “sundaes” ever!! my nephew loves maraschino cherries too so he’d totally dig that it’s in a cupcake and not on actual ice cream! may have to surprise him with these one day! These are super cute and super yummy! The Hershey’s recipe is my only go-to for chocolate cake. You just made it better with all the other extras. I’m bookmarking this one! OMG JamieAnne they are the best! I’m not going to make anything so elaborate for Katelyn’s 4th birthday, she is happy as long as there is pink icing. Katelyn and Henry are soudning similar to Emma and Blake. I remember when all I wanted was Katelyn to talk – sometimes now I wish she didn’t – what a parrot! LOVE THESE! Your photos are stunning too! These really do look like ice cream sundaes! so cute! they sound delicious! I just made these for a party tomorrow and they look and taste amazing!! sorry for sounding dumb but what exactly is he “cone ” method? I am dying to try these for a kids party, they look amazing:) thanks! OMG! 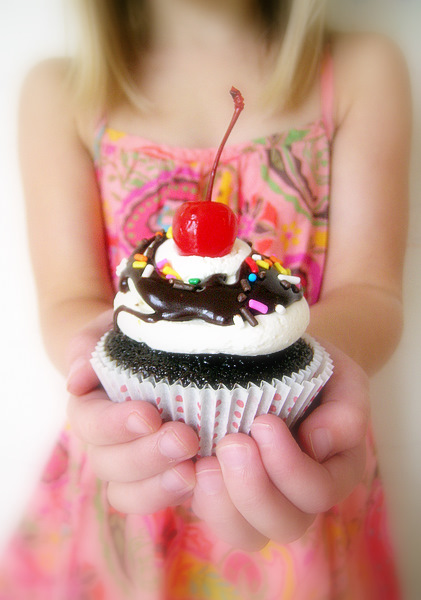 I love these sundae cupcakes! Please visit us @ Twicebakedtwins.com. Happy Holidays! These are soooo….cute! I’m having an ice cream themed birthday party for my 2 yr old and was looking to make cupcake cones….but these are so much prettier! This cupcake is so cute !!!!! The minute I layed my eyes on it I coudent take them off. its soooo cuuuuute !!!!!! I made them, although delicious, they did not have a cake like texture and did not rise enough. Also they stuck to the cupcake paper baking cups. I followed the recipe to the T. Are they supposed to be like that? Hi Sarah, no, they are not supposed to be like that. Something must have went wrong. The first thing that I can think of is, when you said “they did not have a cake like texture and did not rise enough”, do you know if your baking soda and/or baking powder is still good? Check the expiration date, and know as well that even if the expiration date hasn’t been reached, I have read that after opening, they tend to degrade in about 6 months. This happened to me once before – I had a string of cupcake failures and I eventually realized it was because of my baking powder! There are tests you can do to see if it still works – just google how to find out if baking powder/soda is still active – but when I did this test on my baking powder, it apparently was still active. I threw it out anyway and bought a brand new tub of it and my cupcake failures were over! As for the cake sticking to the paper, it could have had something to do with the above. I’m not entirely sure. ok, thanks for the info…i have to do a batch for a birthday party for the 31st, so i’ll do a run test with new baking powder and soda powder before that and I’ll let u know how it turned out…thanks again. I made them again with a new box of baking soda like u said and they came out just the way you said they should. OMG really delicious! I read on the box of baking soda that it looses its effectiveness after 30 days. I also made your vegan cupcake recipe, I have a grandaughter that is alergic to eggs. Can I omit the cocoa powder to make vanilla ones? or is there another recipe for vegan vanilla cupcakes. BTW these came out amazing to. Her Birthday is in August also and I’m going to make a Hello Kitty Rock Star cupcake stand. That is great, Sarah! I am so pleased that I could help you out! In regard to your other question, I honestly cannot guarantee that omitting the cocoa powder from the vegan chocolate cupcake recipe will result in a tasty vegan vanilla cupcake. I have never tried this before… actually, I don’t think I have ever even seen a vegan vanilla cupcake! Sorry I can’t be of more help with this one! ok no problem…I’ll try it and let you know! Wow! I WILL be making these for my daughters 2nd birthday in two weeks! Anything I need to know (or be prepared for) in advance, before I tackle this task? I am fairly new to baking (since the last six months or so), but thoroughly enjoy it, nonetheless!!! These are so cute! 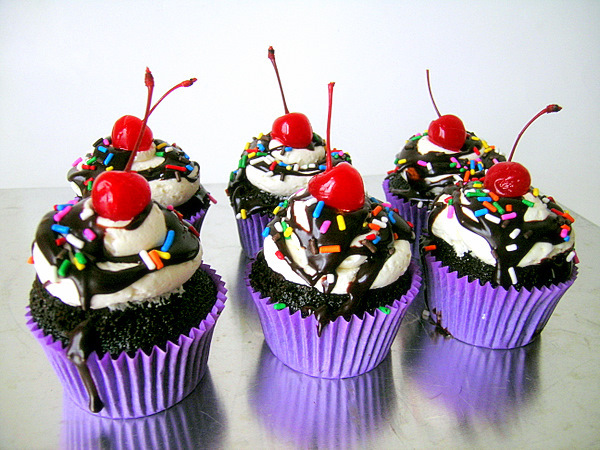 Ice cream sundae cupcakes! How adorable can these be? Perfect treat!